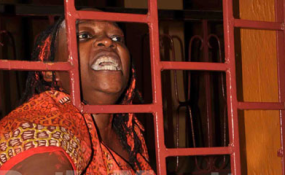 The 45 year-old woman has been detained at the Luzira women prison since November 7th last year on two charges: cyber harassment and offensive communication. Both charges are related to the country's relatively new Computer Misues Act of 2011. The cyber harassament charge is based on her poem on her social media account that was deemed by the prosecutor "to be obscene, lewd and indecent", her lawyer, Isaac Ssemakadde told RFI. In the second charge of offensive communication, Ssemakadde says her offence includes "disturbing the peace, disturbing the privacy, and disturbing the quiet of another person through repeated use of electric communication." He adds that in this particular case, she allegedly "harmed, injured or inconvenienced the honourable president Yoweri Museveni as a result of a poem posted by Dr. Nyanzi". Nyanzi's methods of activism are considered unconventional by most standards. But in Uganda, there is in fact a longstanding tradition of 'radical rudeness', harking back to pre-independence days of the country in the late 1940s when it was still under British control, and where social etiquette and manners were encoded in the British culture of politeness and sociability. In an article entitled "Radical Rudeness: Ugandan Social Critiques in the 1940s" by Carol Summers, she points to methods of activists who did not have a "clear issue-based politics or resources to engage in active state-building". Instead, activists resorted to a public strategy of insults, disruption and disorderliness "that broke the conventions of colonial friendship". Nyanzi, frustrated with governance issues in the country, spoke up and referred to President Museveni as a "pair of buttocks" on social media. She was arrested and the 'pair of buttocks' trial is still on-going though inconclusive says Ssemakadde because Nyanzi refused to take and has legally challenged a prosecution-ordered medical test to determine if she was mentally ill.
For the time being he says the trial was "frozen by a court order". "Dr. Nyanzi was specifically selected by the prosecutor in Uganda to make an example of her so that they can contain robust speech and debate and discussion on social media," says Ssemakadde. This "is a very important case because increasingly the kind of law the government is using is relatively new" and clearly has a direct impact on one's freedom of expression, says Rosebell Kagumire, a Ugandan journalist and feminist told RFI. "The question [is] of personal data and how it ends up in government access. The fact that you need a 'warrant' also enters the conversation, and how [the] government can obtain data about citizens and how the process should be respected," explains Kagumire.